We didn't fare much better -- finding ourselves in the company of what were apparently a deaf mute and a three-year-old child, our confused troop made it through several doors, retreating into the best corner possible just in time to defend ourselves from a pack of Flaming Hellhounds. Once we had the opportunity to breathe and reload, the toddler commenced to opening every door possible. Meanwhile, the deaf mute waded hip-deep into a gaggle of zombies, pumping his trench gun for all he was worth. Nick and I did what we knew best: stayed put, and shot at everything else that moved, groaned, or otherwise didn't look right. Miraculously, we cleared the fifth wave, laughing at our sheer luck and wondering what step to take next. Ultimately, we hesitated too long and were overcome despite our near-perfect choke point. 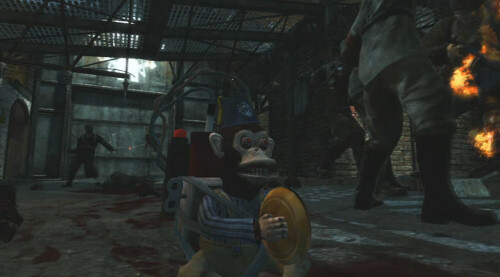 Der Riese starts off quick, and does not stop. From the very get-go, you're charged with four entry points to watch, none of which are within direct view of any others. Three windows are separated by a large teleporter platform (which remains inactive until you activate the mainframe), and the fourth resides at the bottom of a staircase that descends below floor-level. Once you reach the fourth wave, you need to heavily consider moving out of the starting area and through your choice of two doors. Eventually, all areas lead back into each other, but the key to Der Riese is to move from choke point to choke point with a clear goal in mind. We didn't have this kind of coordination during our first trial run; another shot at it with my brother last night showed me the impact of knowing what the heck you're doing. 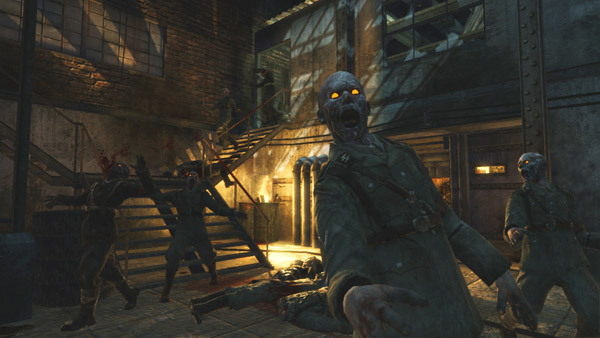 Der Riese is by far the most harrowing and most intricate Nazi Zombie map yet. It's like the climactic final act of your favorite slow-moving-zombie film, with some interesting zingers thrown in. For example: the Flaming Hellhounds are back, but rather than running full tilt at you, they will sniff you out before charging and pouncing; the effect is so very creepy. A new randomly dropped power-up joins the Kaboom, Double Points, and Insta-Kill drops: it's a glowing carpenter's hammer, and touching it instantly repairs all entry points. 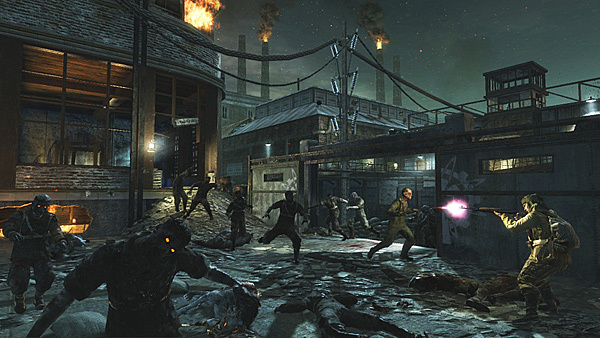 As with Shi No Numa, the zombies themselves are original to this map. Expertly placed light sources -- such as bonfires and floodlights -- cast the shadows of the zombies before they round the nearest corner; while this can be to your advantage, it's at the cost of a wet pair of britches. Flickering shadows are to Der Riese what legless crawling Imperial zombies were to Shi No Numa. Speaking of which: "crawlers" (zombies whose legs have been blown off by a grenade) are still a major part of gameplay strategy, especially with all of the stairs and ledges in Der Riese. The new weapons for this map are: the Bowie Knife, a much more powerful knife that replaces your standard melee weapon; and the Monkey Bomb, a wind-up monkey toy that attracts the attention of the zombies before exploding (the Left 4 Dead pipe bomb comes to mind). For the first time, players can wield the Wunderwaffe DG-2 (lightning gun) and the Ray Gun simultaneously. The Ray Gun has been factored into the curious storyline that Treyarch has been fashioning since Zombie Verrückt (Map Pack 1)...some speculators consider it to be another entry in the Wunderwaffe category. Der Riese is fraught with more electricity traps, which are now joined by three teleporters pads...each has to be linked with the mainframe before it can be used, ensuring that you will spend some time dashing back into areas that you had long since abandoned to the shambling undead invasion. Once activated, you can transfer yourself one way to the mainframe for 1,500 points. There are familiar Perks-a-Cola stations throughout the map and an all-new Pack-a-Punch machine that upgrades your weapons in various ways once you've linked up the teleporters. If you sit back and look at the Nazi Zombies mode as a whole, it's pretty amazing the diversity that Treyarch has managed to pack into four maps. Each one has its own appeal, and even the original Nacht der Untoten holds plenty of replayability despite being expanded upon for the last ten months. Der Riese is wildly popular right now, taking 71% of the current CallofDuty.com poll, which asks gamers to choose their favorite map in Map Pack 3. Considering that Map Pack 3 is in my opinion the most brilliant three maps in the entire versus mode, the poll is shedding tons of positive light on Der Riese. I can't wait to play it again.